Mushroom and Beer Soup isn’t a traditional Russian soup, however Russians love all things mushrooms. There are many ways to make mushroom soups with many varieties of mushrooms, depending on what part of the world you live in. My first memories of mushrooms came from a book from which we learned to read in Russian from, our Bukvar (Буквар), which was a Soviet state sponsored beginner reader book. It seemed that the boys and girls in this book always went mushroom picking in the forest. I always wondered where their parents where, and why they were allowed to wander in the Russian forest with all those bears around. Mushroom picking is definitely part of the Russian culture. My mum went mushroom picking with her friend Molly in Canada, who knew so much about mushrooms, eat the wrong ones and you could die. Wild mushrooms taste so much better than our store bought varieties, and have a different flavour, not all mushrooms taste the same. My all time favourite is called Shaggy Mane or Lawyer’s Wig which can’t be bought in a store, as it needs to be used within hours of picking, so good! They’ve apparently been introduced to Australia, but I haven’t seen any of them growing around me. Not all soups are made with fresh mushrooms, you can also add dried mushrooms by just rehydrating them. Adding dried mushrooms to your recipes can give a different mushroom taste and a depth of flavour that regular fresh mushrooms can’t. I find the Asian grocers seems to have the largest selection of dried mushrooms. I used both in this recipe, and you could even make Mushroom and Beer Soup entirely only from dried mushrooms. Now beer isn’t usually associated with mushroom soup, but it goes surprisingly well. Beer is usually made with barley, just think of a barley soup, and then you understand how this works in this recipe. Any alcohol boils out and you are left with a subtle barley flavour. Mushroom and Beer Soup is similar in consistency to Pumpkin Soup, and similar in the way it’s blended using a stick blender. I always make my soup stock from scratch because it tastes better and is healthier, check out my vegetable stock recipe. This vegetarian soup incorporates some of the great flavours of Russia; mushrooms, potatoes, barley from the beer, and of course, top it off with sour cream on a crusty loaf. You can’t go wrong with this great tasting Mushroom and Beer Soup. Bon Appetit! Приятного аппетита! Make vegetable stock according to directions, or if in a hurry use store-bought stock. Cut the onion into quarters and thinly slice. In a frying pan, heat some butter until hot and fry the onions and garlic until golden brown. When they are cooked, slowly add a bottle of beer, bring to a boil and sauté for a few minutes. Remove and set aside. Brush or rinse the mushrooms clean and thinly slice them. In a frying pan, heat some butter until hot and fry mushrooms for about 10 minutes. Remove and set aside. Divide the mushrooms in half and keep half aside separately to add back into soup after you blended the soup. In a large stockpot, add the vegetable stock, half of the fried mushrooms, fried onions, potatoes, bay leaf and thyme sprigs and bring to a boil and simmer for about 20 minutes, until the potatoes are cooked. Remove the bay leaf and thyme sprigs. 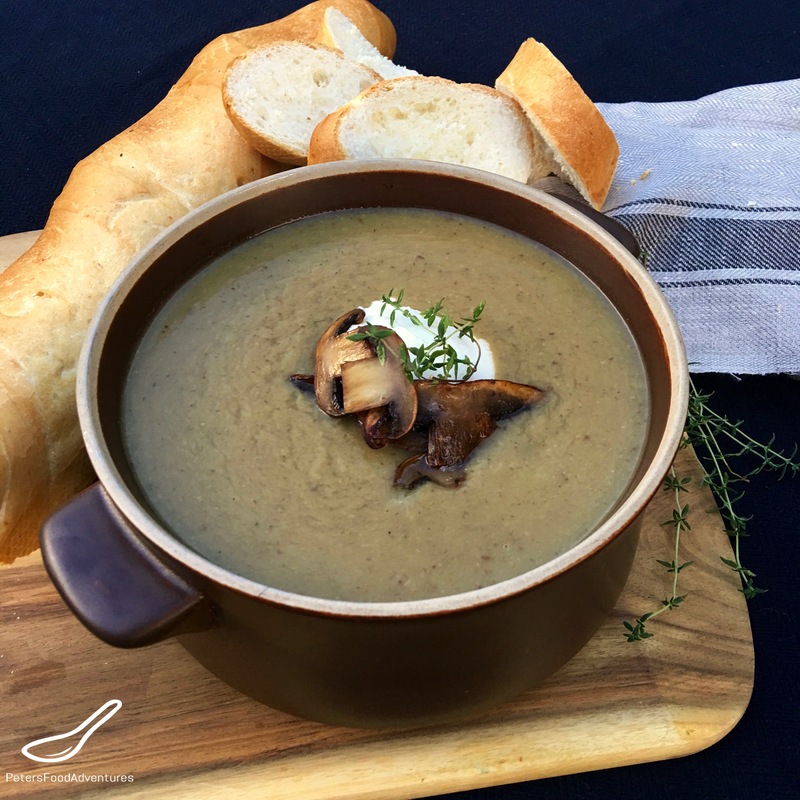 Using a stick blender or immersion blender, blend the mushroom soup until you have a smooth consistency. Add the remaining mushrooms back into the soup. Optional: can mix throughout a quarter cup of whipping cream. Season with fresh thyme, salt and pepper to taste. Serve with a crusty loaf of bread. I love mushrooms, they are my favorite vegetable! Me too! But are they a vegetable? On that I wasn’t sure!! I guess technically they area fungus. But can they be both! I’m not sure! ???? I think that is correct. Kinda like the tomato. Technically it is used like a vegetable but it’s really a fruit. Thanks! It’s different, but I like it! I think I like it not creamy, but with some sour cream slathered on a piece of bread, eaten together. ???? Thanks! Yes, vegetable stock works great! Dried mushrooms are great, shame that many people don’t use them commonly! Thanks for checking my recipe out! ??? ?